TOBYVILLE — One might think Lacy Garcia will have the home-track advantage when the 2017 Mike Cupps Memorial Lawn Mower Races return to Sweet Berry Farm, but it’s been two years since she’s truly raced the dirt track. “I’ve ran a couple of practice laps,” said Garcia, who sat out last year’s race because she just had a baby. Her parents, Dan and Gretchen Copeland, own Sweet Berry Farm, where she works. Named in honor of a lawn mower racing advocate who died of cancer, the Mike Cupps Memorial will be held this year on Saturday, April 22, at at the farm, 1801 FM 1980 north of RR 1431 between Marble Falls and Granite Shoals. Registration for racers begins at 11:30 a.m. with races at 2 p.m. Admission for spectators is $5 with proceeds going to fight cancer. Since its inception, the event has supported the fight against the disease with most funds raised going to local families facing it in their own lives. This year, proceeds from the Sweet Berry Farm race will go to Alyssa Flores, an 8-year-old from Granite Shoals who was diagnosed with cancer in August 2015, said Dennis Drake, who helped bring the races to Marble Falls. Flores also was the recipient of last year’s funds, but bad weather hurt race receipts. Cupps was a major player in helping lawn mower racing grow. He was one of the first people to set up a system in which racers had a “go-to” spot for supplies, gear, and equipment. Cupps even developed a specialized racing axle for mowers. “He just loved racing and the people in it,” Drake said. 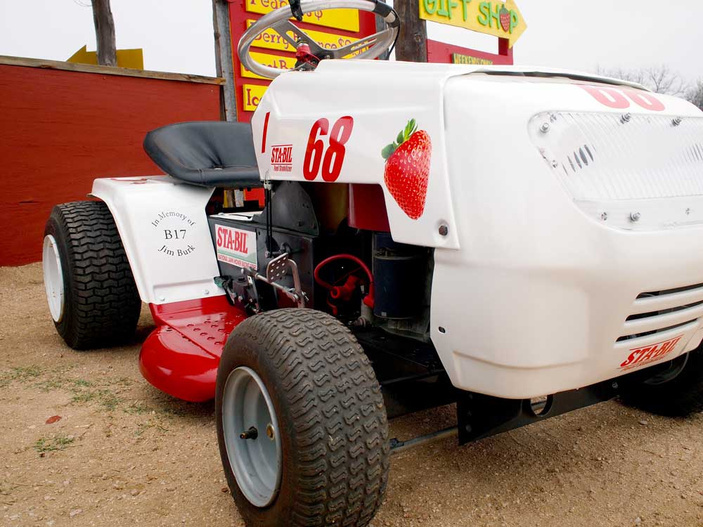 The Mike Cupps Memorial is part of the Lone Star Mower Racing Association’s circuit. Along with the state organization, there’s even a national one, the United States Lawn Mower Racing Association, which is celebrating its 25th anniversary in 2017. In other words, mower racing is not just a passing fad. Take a look at Sweet Berry Farm, where, about five years ago, Dan Copeland built a dirt track for the first Mike Cupps race and eventually got the racing bug himself. Garcia followed three years later when Dan wanted to step up into a faster class. (Yeah, there are seven different classes in mower racing.) He nudged his daughter into giving his older racing mower a try, and she loved it. One of the many mower maneuvers Drake said people should watch for is how the tractors take the turns. Now, these aren’t your typical mowers, Drake explained. The racers modify their rides by removing blades, adding stronger axles, and kicking up the power. Some of the mowers in the top classes can hit 70 mph on a straightaway. Drake said that, on this track, some of them race in the 40-mph range. Makes you wonder how long it would take to mow your backyard with one. As for Garcia, she’s looking forward to getting back on the track for the 2017 race and possibly moving up in the ranks. She currently competes in the IMOW class. During her practices, she noticed some rough spots on the track, which she easily negotiated as the only tractor out there. With several other mowers next to her, however, Garcia knows she’ll have to find the right space and angle to stay ahead. Go to lsmra.com for more on mower racing and sweetberryfarm.com for more on the race venue.